Read English fictions of your choice. Books are not costly here. You get cheap books in every nook and corner. If you want to pick up an interesting cheap English novel, go to the closest used book stores. They will generally also have old novels, books and magazines. These won’t be good quality. They will all be second-hand. But that’s okay, they will be nice and cheap. Pick up something that interests you. Take it home and read it. Be sure to look up all the new words you come across in the book. Love FM 97.5 has some good programs that are designed to teach English to the listeners. Besides this, there are also many different radio stations available nowadays in the big cities. Some of these radio stations are in English. Listen to them to get a feel of the language. Besides the radio, you could also listen to news in English. It’s available on a wide variety of channels. The news is a good place to get input of the English language because it is spoken in a very clear, easy-to-understand way. If you want to speak English fluently, you will have to learn to “think” in English. When you are constructing sentences in your mind before saying them, think in English and form them in English in your mind. Get yourself some English learning software! This link will take you to ebay.in where you can purchase this software and have it delivered to your home. If you are new to ebay, do not worry, you can just sign up from here free and buy whatever you are interested in right now! It’s quite easy! 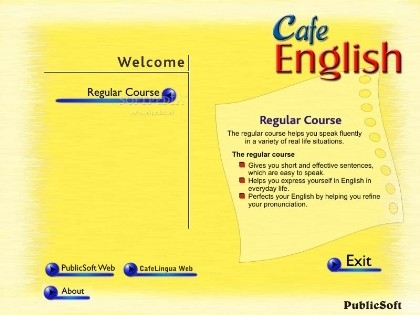 Once you sign up, search for “Cafe English” OR “Learn to speak English”. You could then choose one of the results and buy the kit!